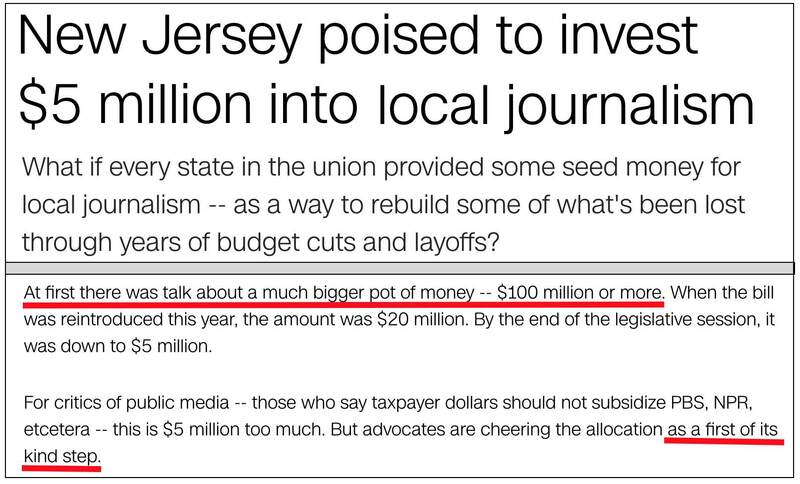 AP reporter Mike Catalini wouldn't even admit that New Jersey is actually spending money. Catalini's glowing description of the supposedly "trailblazing, nonpartisan, nonprofit" Free Press Action Fund is the very definition of fake news. It only took a few minutes to determine that FPAF is another in a long line of far-left activist and advocacy groups. Readers would think from Catalini's and other media stories that all FPAF wants to do is to improve local news coverage. Horse manure. The group's home page expresses alarm that "8 media giants control 788 broadcast-TV stations, resulting in local news that all looks and sounds the same." So? That's less than half of the 1,761 commercial TV stations which were on the air in 2017. The local TV business is relatively fragmented compared to many other U.S. industries which are considered fiercely competitive. So much for being "nonpartisan." In other words, FPAF was willing to take what it considers a relative pittance now so that it could declare a "first of its kind" victory in hopes of getting much more money in New Jersey and other states later. What the AP's Catalini and CNN's Stelter both failed to note in their "first of its kind" celebration is that there is already at least one outfit which has been providing local and state news and genuine investigative journalism since 2009. It's called Watchdog.org (I briefly wrote for the group in 2012 and 2013). But Watchdog leans right, and isn't interested in feeding at the public trough to help the establishment left control local news the way it controls the establishment press. So I guess it doesn't "count."